What's The Best Car Nobody Is Buying? The thing about good cars is that they're good. They're fun to drive, great to look at, and tick all the right boxes. The problem is that sometimes there are great cars out there that people just aren't buying. What's the best car nobody seems to be plunking down their hard earned dollars for? 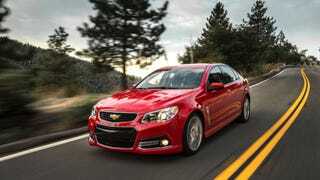 Number one on that list has to be the Chevy SS. People complained that the Impala was just way too boring and there needed to be a rear-wheel drive one. So, in a rare move, Chevy listened and imported a rear-wheel drive muscle car for your tire smoking pleasure. And then, probably against their better judgement, they gave it more paint options, magnetic ride, and a manual gearbox. It's literally the car gearheads have been begging for. And nobody is buying it. The majority of us have never seen one on the road. And that's a shame, because the SS is quite a good car. What other great cars aren't being bought by anyone?